Asphalt is the pavement of choice for sustainability. It’s 100 percent reusable and recycled at a higher rate than any other material in America. In addition, asphalt pavements are able to use waste and byproducts from other industries — reducing environmental impacts. Asphalt pavements also require less energy to produce than other paving materials, and their production emits fewer greenhouse gases than concrete pavements. Noise barrier walls are both expensive and ineffective for urban noise abatement, but asphalt—already the quiet pavement—can help reduce noise generated at the tire/pavement interface. This document describes how stone matrix asphalt and open-graded friction courses can be highly effective and cost-efficient noise abatement solutions. This brochure outlines the various ways which asphalt pavements may be used to obtain or contribute to LEED credits. LEED Green Building Rating System is a benchmark or scorecard for the design, construction, and operation of green buildings. Asphalt is the sustainable pavement for construction pavements. Low consumption of energy for production and construction, low emission of greenhouse gases, and conservation of natural resources help make asphalt the environmental pavement of choice. Research and field practices by the asphalt industry have constantly enhanced the viability of asphalt as an environmentally sound building material. Carbon Footprint: How Does Asphalt Stack Up? This paper examines greenhouse gas production of asphalt and concrete pavements. The analysis clearly shows that asphalt have a much lower carbon footprint that concrete. When it comes to pavements, asphalt is the more sustainable choice. For improved stormwater management, clean drinking water, and reduced roadside pollution, asphalt pavements are clean and environmentally beneficial. A detailed guide to the design, construction and maintenance of porous asphalt pavements. This document combines latest national best practices with Wisconsin-specific guidance and will be of value to pavement owners, designers and builders. Reclaimed and Recycled Asphalt: Where is the Payoff? 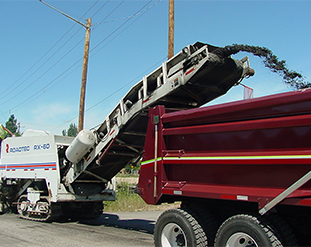 End users of reclaimed asphalt pavement (RAP) and recycled asphalt shingles (RAS) in asphalt mixes – both contractors and government agencies – are benefiting from the lower raw material prices that the bituminous and mineral reclaimed products bring to the table. Those components – which are 100 percent recyclable – replace virgin materials used in asphalt mixes, whether hot, warm or cold. Warm mix is an important step in sustainable development, simultaneously conserving natural resources, reducing the carbon footprint of the asphalt industry, and improving the quality of the pavements that Americans rely on. MSA Professional Services, Inc. (MSA), an employee-owned firm serving public and private sector clients, has annual billings of $23 million. Incorporated in 1962, MSA is well known for providing complete municipal services to communities of all sizes, and transportation services to counties and WisDOT. We presently serve more than 200 communities and have had transportation projects in 50 counties. Approximately 300 professionals and support personnel work out of offices in Baraboo, Beaver Dam, Friendship, Madison, Marshfield, Rhinelander, and Rice Lake, Wisconsin; Dubuque and Des Moines, Iowa; Galena, Illinois and Duluth, Minnesota.